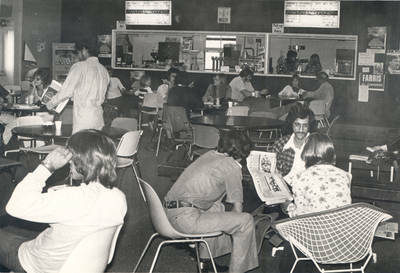 "Snack bar inside the old Student Union, Chapman College, Orange, Calif"
Snack bar inside the old Student Union, Chapman College, Orange, California in the 1970s. Originally the manual arts building and bus repair garage for Orange Union High School. Building annex additions through 1975 increased the size to 19,680 sq. ft. Used as a student union by Chapman College. In 1996 the building became the Cecil B. DeMille Hall, housing the Film and TV department.